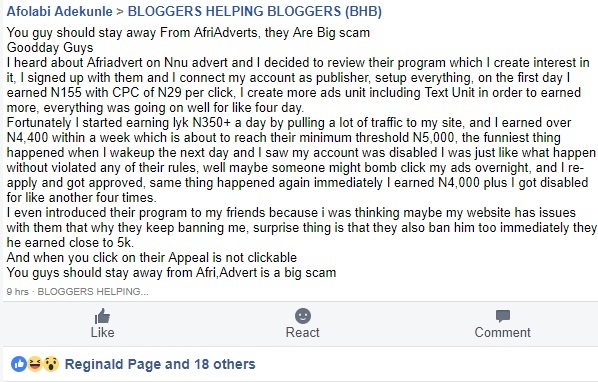 Blogging Reviews AfriAdverts Review - Do They Always Ban Once You Hit Payout? AfriAdverts Review - Do They Always Ban Once You Hit Payout? Blogging is one of the most popular ways of making money online. AfriAdverts is one of the newest ad networks, and more keep coming up day by day. Being a Nigerian indigenous ad network, we have decided to get reviews from the users about how the site functions and publish them here. Our AfriAdverts review is honest, and from users reviews because we haven't used them on our site once. I saw the AfriAdverts adverts on one of the popular get paid to read news forums in the country. I didn't give them much interest because I was already using Media.net and MGID ad networks on all my blogs, and was getting positive results. I don't support the idea of having to jam-pack ads on your blog, they don't increase your earnings or potentials, rather harm you! 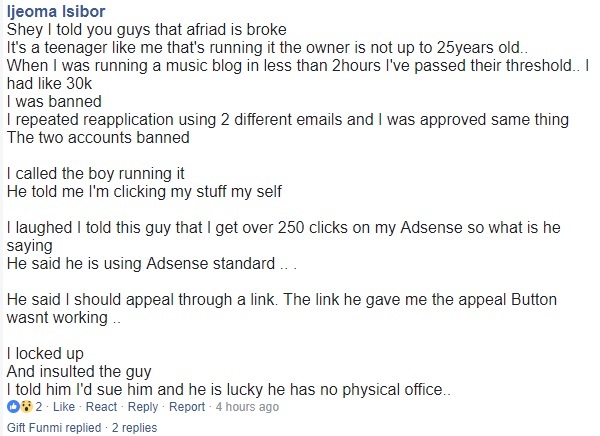 Now in the case of AfriAdverts, they will pay you to display ads on your blogs and websites. Their approval is quick and they will place different ad banners on your site. I have seen their ads on a few of my blogger friends' blogs, and they are all beautiful. Another awesome part of using them is that they pay you directly into your bank account, and their minimum payout is only ₦5,000. However, there was a reason why it didn't appear on our list of the top Nigerian ad networks, and we will see that below. Keep on reading! We have previously published an article on everything you need to know about blogging in very easy steps, and you should consider checking it out. In the last step, we talked about monetizing your blog. In making money from your blog, one of the easiest ways to do that is by the use of an ad network. An ad network is probably the easiest because it gives you the freedom and flexibility of writing your content, and by just publishing and sharing, you get readers who do not need to to purchase your goods or patronize your services to earn you money. In fact, by just viewing your blog, some ads that pay for impressions such as the Google AdSense would have made you some little big money. With Google Ads being the chief of all, there are also many other high paying ad networks such as Media.net, Chitika, InfoLinks, MGID, Taboola and a good number of others. Some others like the AfriAdverts are also rising day by day to tap from the lucrative ad networks business. 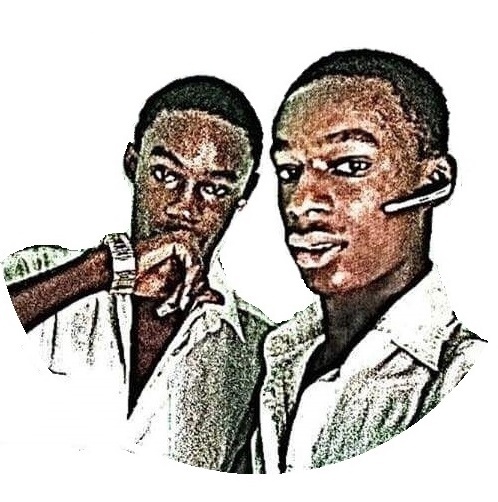 I read up a review of the AfriAdverts on BloggingSeries.com the first time I heard about it, and it was all positive. Fast payout, ₦50-₦100 cost per click and ₦5,000 minimum payout, that would be interesting for any new blogger. - If you do things right, they would verify your site immediately and you can now create ad units and start making money. That was easy right? However there are some negative reviews that have been associated with the site. We didn't publish the ad network's review because we had to do a rigorous research, get some evidences of successful cash outs and be sure of what we are publishing. We met a Facebook user's review of the ad network and here's what he has to say. Really shocking! So they ban you once you reach payout? An amazing site to work with of course, they are. What about an un-clickable APPEAL button? Such an awesome way to help you report when they don't treat you right. I was thinking maybe the Facebook user was paid to defame them until I happened to come across another review. This one is even funnier. How can he say that the owner is broke...Lol! So they even banned the first Facebook users account, then his friends, and then the second. Not a single person came to tell us that he had cashed out from them. Well, maybe they are all coincidences. I really can't tell, what do you think? Have you cashed out from them once? 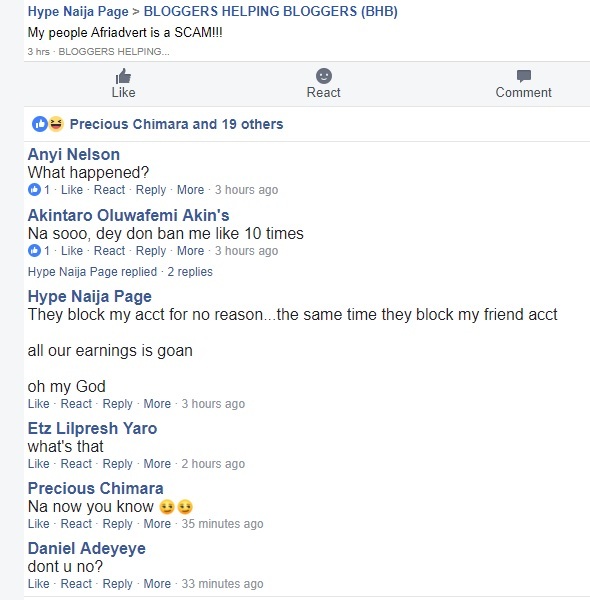 Please help us in this review, send us a screenshot of your earnings (and bank alert too because they may still ban you at payout) together with the website where you are using the ad network on via contact@infoguideafrica.com! Kindly share, we are here to make the internet favorable to everyone!